Imagine a birthday party so filled with laughter and joy that your child remembers it forever, sounds impossible? 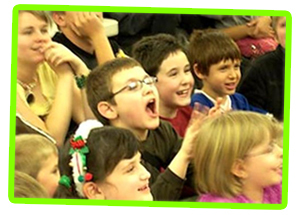 Your child becomes the STAR of the show in an entertainment package that features Hilarious Comedy, Amazing Magic, Funny Puppetry, Storytelling and Free Gifts for ALL the kids. Check out the video below and you'll hear all the laughter and fun. Discover how easy it is to throw a Stress-Free party that will create wonderful memories that'll last a lifetime. Don't risk disappointing you or your child. WARNING: I'm not responsible if you can't handle all the hugs and kisses you will receive from your child for creating the Best Party Ever! You can also request your show on line. Simply fill out the form below and I'll email you complete, no obligation details of my different programs. Armando Comedian 4 Kids © Copyright 2019. All right reserved.